BBI (ACT) was honoured to be recognised on Indonesian Independence Day by the Indonesian Embassy in Canberra for promoting the learning of Indonesian in the Canberra and for contributing to friendly relations between Australia and Indonesia. BBI (ACT) looks forward to further cooperation with the Embassy and interested community members who are seeking to deepen ties between our two countries. 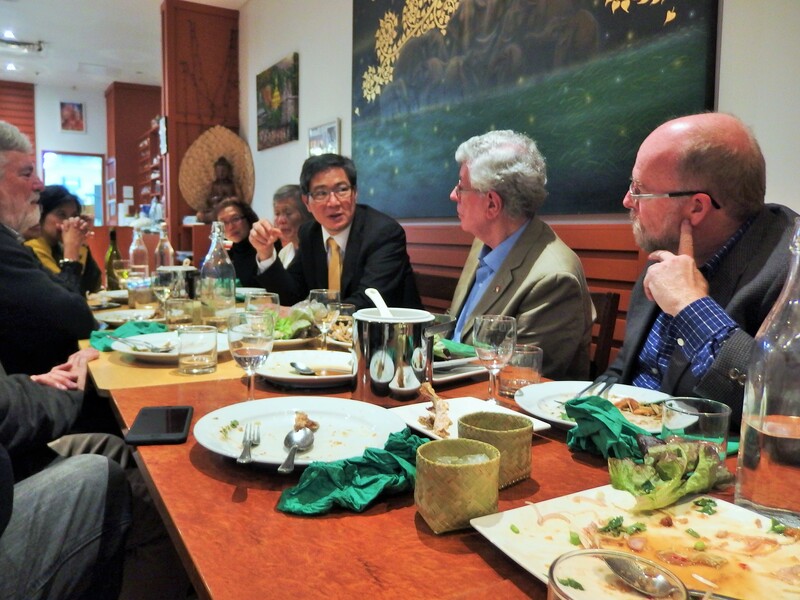 On 22 May 2017, BBI (ACT) Board members farewelled Bpk Ronny Nur, the Indonesian Embassy’s Cultural Attache at a dinner in Canberra. 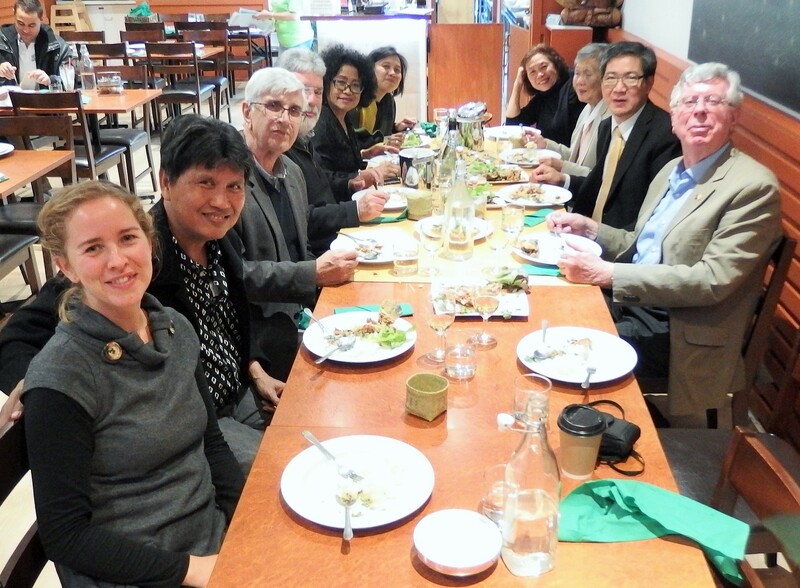 Pak Ronny, a member of the BBI (ACT) Board, was praised for his energetic efforts to promote the teaching of Indonesian in schools and universities in the ACT and throughout Australia. BBI (ACT) Chair, Heath McMichael, thanked Pak Ronny for his efforts in support of BBI (ACT)’s mandate to foster the learning of Indonesian and understanding of Indonesian culture within the broad community. Heath noted Pak Ronny had lent BBI (ACT) valuable assistance in organising events at the Embassy’s Balai Kartini, for example, the Women in Poetry evening in 2014 and dinners for Indonesian language teachers in 2015 and 2016. Vice Chair, George Quinn, said Pak Ronny’s contribution to a deeper understanding of Indonesian culture within Australia were recognised throughout Australia. Board member, Amrih Widodo, said Pak Ronny, a trained scientist, had set a very high benchmark for future Cultural Attaches at the Indonesian Embassy. All board members wished Pak Ronny well in his new role at the Agriculture Institute in Bogor. In thanking the Board, Pak Ronny said he regarded Australia with great warmth as his second home. He looked forward to visiting Canberra from time to time when he visited Armidale in NSW as a visiting professor at the University of New England. The federal government has allocated $100 million to fund the New Colombo Plan over the next five years. Amid the gloom of the 2014 Budget there is a morsel of good news for university students interested in studying in Asia. According to Professor David Hill of Murdoch University, the allocation of funding for the New Colombo Plan does not seem to have been affected in the Budget. See Professor Hill’s Facebook comment at: https://www.facebook.com/profile.php?id=100003387519360&fref=ts . For information on the New Colombo Plan go to: http://www.dfat.gov.au/new-colombo-plan/pilot-program-fact-sheet.html . For George Quinn’s take on the start-up of the New Colombo Plan go to: https://theconversation.com/a-problematic-start-to-the-new-colombo-plan-25213 . The Australian government is funding a national web portal for university language courses. A two-year grant of $300,000 will permit students to see the full range of language courses on offer from global languages through to Australian indigenous languages. For more see Bernard Lane’s report in The Australian May 7 2014. THE first national web portal for university language courses is expected to lift student numbers and extend the reach of less -taught languages such as Hindi, Greek and Portuguese. Student demand is often underestimated when the real problems are lack of clear information and awkward degree structures, according to Melbourne University’s John Hajek. “If you don’t know it’s there, how do you enrol in it? And if there’s no one-stop shop, it’s easy to go around in circles,” he said. President of the Languages and Cultures Network for Australian Universities, Professor Hajek is one of four academics who have won a $300,000 twoyear grant from the federal Office for Learning and Teaching. The idea is to set up the first genuine national languages portal, allowing students to see the full range of courses on offer from global languages through to Australian indigenous languages. The portal would show which languages are available online, and include anything from semester-long courses to full degree programs. “It’s often the case that a student may think about doing a language but they don’t know which — well, with this onestop national portal, they’ll be able to look at all their options,” Professor Hajek said. As well, the project will see a trial consortium of universities — Melbourne, ANU and Macquarie — experiment with collaboration in delivery of lesstaught languages and advanced courses. “By fourth-year level enrolments are relatively small, so it may be more efficient to offer a shared online course,” Professor Hajek said. The web portal and consortium will also try to simplify the often convoluted process of cross-institutional enrolment, whereby students go further afield to pick up languages not offered at their home university. The other chief investigators on the project are ANU professors Jane Simpson and Catherine Travis and Macquarie professor Martina Mollering. The web portal is expected to go live in about 18 months. The Australian government is calling for applications for Endeavour Language Teacher Fellowships for 2013. The Fellowship provides in-country training for language teachers over three weeks in one of ten countries. It covers the cost of return airfares, accommodation, tuition, some meals, field trips and cultural activities in the coutnry of the language you teach. The Indonesian option will be conducted by the Indonesia Australia Language Foundation in Denpasar, Bali, in January 2013. The program has an intensive language study component backed up with cultural studies and field trips around the island of Bali. Discrimination against Indonesian prisoners in Australian jails? A news report in The Sun-Herald (May 27, 2012) claims that Australian prison services are withholding the wages earned by Indonesians currently in Australian jails. A spokesman for the Minister for Corrective Services in Western Australia, Terry Redman, said wages earned in jail were given to the Indonesians on their release and prior to deportation. But Australian human rights lawyers say this kind of action is hurting poor families in Indonesia. The Australian Lawyers Alliance said there had been deaths in Indonesian families as a direct consequence of the detention of Indonesians in Australia and their consequent loss of income.